Jennifer Garner will never, ever be confused with Liam Neeson, no matter how many bad guys she kills, but that doesn’t matter she can’t try. In “Peppermint,” she morphs from a loving mom into a cold-blooded murder hell-bent on avenging a gang’s wrongdoing to her family, which is eerily similar to Neeson’s role in “Taken,” when he takes out those who hurt his family. The two films share a common denominator: director Pierre Morel, who essentially turns “Peppermint” into another “Taken” movie when the franchise should have been left alone. Garner plays Riley North, a devoted mother and wife who works long hours to provide for her lower-middle class family. She becomes a modern day Rambo after her husband and young daughter are gunned down by gangsters at a public carnival in front of her eyes. One minute, she’s dressed as a soccer mom; the next minute, she’s wearing tight clothes that show off cleavage and using a maxi pad as a makeshift bandage after she’s stabbed. Five years pass between her family’s death and her transformation into an assassin. How did she become as good a killer as John Wick? Good question – it’s one of many that aren’t answered. How did she go from being a pacifist to being able to fight like Ronda Rousey in her prime? Another good question. How was she able to break into facilities and steal military-grade weapons like Danny Ocean? Another good question. Riley’s life changes forever when her husband is asked if he wants to make some easy money by being the getaway driver for his coworker’s plan to rob a sociopathic local drug lord named Diego Garcia (Juan Pablo Raba). Her husband ultimately declines the offer, but not before Diego leans of the scheme and orders a hit that claims the life of Riley’s husband and daughter and leaves Riley in the hospital. Riley’s hospitalized for a month, evicted from her residence, placed on heavy medication and approached by LAPD detective Stanley Carmichael (John Gallagher Jr.) to identify the shooters, which she does easily. But since the entire justice system is corrupt – from the police to the prosecutor to the judge – the killers walk without trial and Riley is sent to the mental hospital. However, she escapes and then no one knows what she does for the next five years. But somewhere along the way, she turns into one of the most efficient killers to ever grace the big screen. She plots her revenge against Diego’s crew and starts taking them out by whatever means necessary – using her array of weapons, including knives, guns and brass knuckles – to get the job done. Oh, and she moves to Los Angeles’ skid row and turns it into one of the city’s safest neighborhoods. How? Again, that’s another good question that needed answering. Garner does her part by being a vigilante who is easy likeable, but the movie’s downfall is that it leaves too many holes to make her story believable. 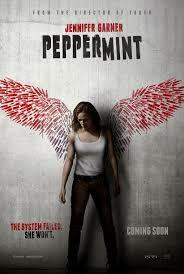 “Peppermint” is entertaining. Watching Garner kill guys and string them up on a ferris wheel and slice, dice and shoot bad guy after bad guy like she’s Rambo in a jungle is enjoyable to watch. While “Peppermint” as a whole misses the mark, Garner shows her career in action movies is far from over.